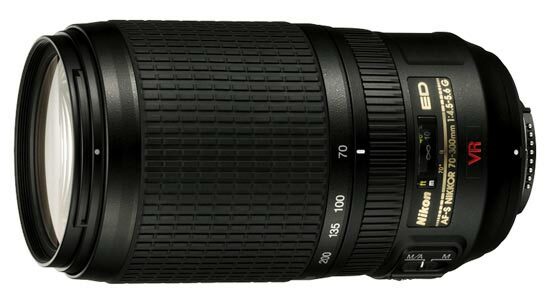 This is a zoom lens manufactured by Nikon and the model was launched 2006. One thing to consider is that the lens has a variable brightness, which means that depending on how much you are zooming the lens will have a different maximum aperture value. At 70 mm the lens brightness is f/4,5 and at 300 mm the brightness is f/5,6. Through the link below you can read more about what this could mean for you as a photographer. If you buy this lens it will come with a lens hood, whose model name is "HB-15". Text from Nikon: "This high-power, high-performance 4.3x telephoto zoom with VR image stabilization lens allows better hand-held telephoto shooting ED glass. High-power 4.3x Telephoto Zoom-Nikkor lens approximates the picture angle performance of a 105-450mm lens on 35mm SLR. Two Nikon Extra-low Dispersion (ED) glass elements deliver superior optical performance for both digital and 35mm photography. ED glass minimizes chromatic aberrations, contributing to superb contrast and resolution performance. Focus as close as 4.9 ft throughout entire zoom range. A Silent Wave Motor (SWM) enables fast and quiet auto focusing, along with quick switching between auto focus and manual operation (M/A and M). A nine-blade rounded diaphragm opening makes out-of-focus elements appear more natural. "